Sage Financials: What’s New in Sage Financials April 2018 Upgrade? This month Sage have included many new features and upgrades for Sage Financials (Sage Live). Some of which, we think are really going to improve the usability of the system. Lets have a look at some of our favourite introductions! Entering and editing accounts now has a single process. !Credit Limits, Default Tax Treatment, Bank Account and Currency information are some of the important financial information you can now enter at the same time as entering the normal account fields. This means that you have all your client or supplier information available to you in one screen. Only the relevant details will show when viewing accounts, based on whether the account is a supplier or customer. A new easy switch button between companies means that you can view account balances from specific companies. You can now also create a transaction without navigating to another tab using the new transaction button. Your accounts can now have notes added to them, allowing you to record any additional information you need to. This is handy for credit control notes or other bits of one off information. The Accounts tab has now been removed, making way for the new way to view customer and supplier accounts. Meaning there is no confusion between who is a supplier and who is a customer! March brought us a new reporting method and April introduces further improvements to this feature. A number of the standard reports have been updated this month to use this new reporting method which means some of your old reports may now be slightly different. You might want to ‘Save As’ your favourite reports as they are going to continue to get updated with the next few releases. It is also now easier to add custom dimensions to reports due to the new report type containing new ‘analysis’ fields. Entering transactions has never been easier! Transactions such a purchase invoices and sales invoices are now entered on a single screen. That means both Header and Line information is entered on the same screen. We also now get a ‘Grid Format’, which you may have noticed in previous releases are now used for entering item lines. Sage have introduced sub-tabs for the header information to make it easier for you to find the information you need. This means there are now sub-tabs for areas like Currency. The creating products process has been improved by Sage. Using a single form, you can now create new products. This removes the requirement to create a product tag record and product record separately. A price can now be specified when creating the record for the product. Ledger Accounts have a new section allowing them to be specified when used for a product. This should remove the complexity around Products, Related Ledger Accounts, Tag Ledger Accounts and Dimension Tags! A new transaction type for Deposits means that deposits taken from customers can now be recorded. They need to appear on your Sales Invoice document as a negative value because it reduces the total amount on a sales invoice. To enter a new deposit invoice head to Sales> Deposits Invoice > New. This is possibly our favourite new feature! One of the difficult things about entering transactions in the past was that you always needed to choose a product, which would determine the Ledger Account you posted to. No more! Rather than posting to the ledger account set on a dimension or tag you can now directly choose a ledger account when entering transactions. Rather than using tags, you can set the transaction type to use ledger accounts specified on each record. To prevent errors through data entry, you can now choose whether to set default ledger accounts. When entering a journal you now specify the required ledger account in a similar manner to the Transaction. Previously, within Sage Financials you could not distinguish between documents or set different sequences for different documents that did not post. The new upgrade introduces a separate numbering system for documents that are not posted, so you can recognise different document types. When a dimension is added to the relevant transaction type, it will now use a separate numbering system. This means Sales Order, Sales Contract and Purchase Order now have document number dimensions. Yaaay! This is one we have long campaigned for. Formerly, reporting capabilities went as far as reporting at Account and Account class levels in Sage Financials. Reporting has now been improved in the new upgrade. With greater flexibility, and a more detailed view of your financial performance you can now report at Sub-Account Level. Sub-Accounts are added at row level, with the feature of adding as a single row or a set of rows. Show Account Detail is a new option in Sage Financials. It shows the balances for the child accounts on the report. When adding dimensions to report columns, Sub-Accounts are now available. Finally, don’t forget to utilise Sage University. Packed full of learning topics and videos, the university will help you familiarise yourself with any new updates. 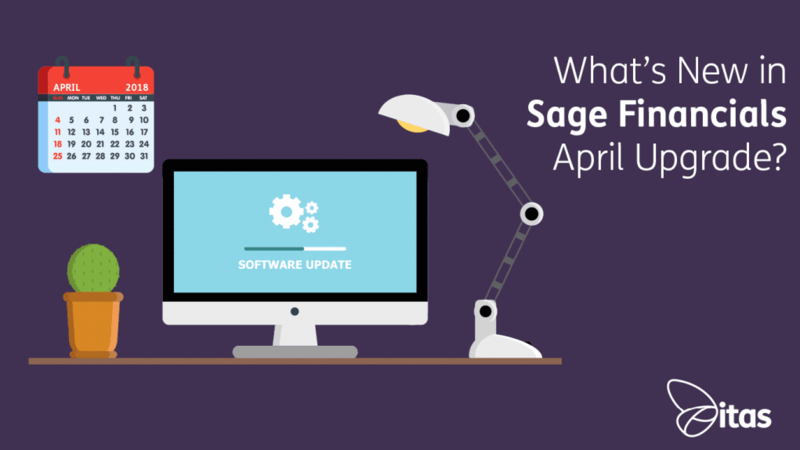 Home » Sage Blog » Accounting software » Sage Financials: What’s New in Sage Financials April 2018 Upgrade?